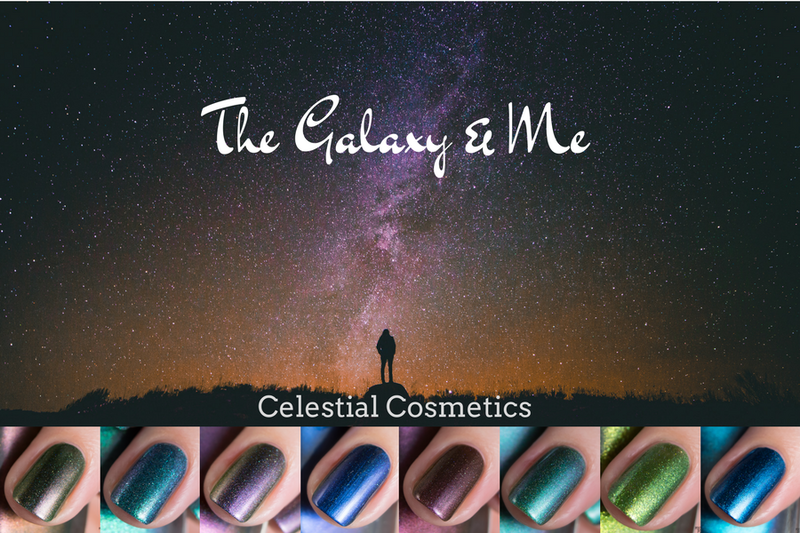 Today I'm excited to finally show you the Galaxy & Me collection from Celestial Cosmetics - so much sparkle and shift ahead! Anyone lucky enough to attend Aussie Indie Con will have already seen this collection, but it has finally been released into the world this week. There are eight shades to show you so let's get to it! 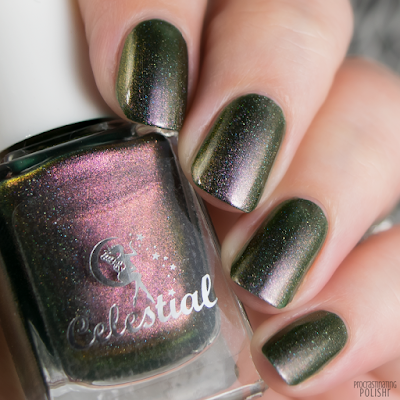 Murky olive green scattered holo with a pronounced multichrome shift to purple, with gorgeous golden/brown tones. 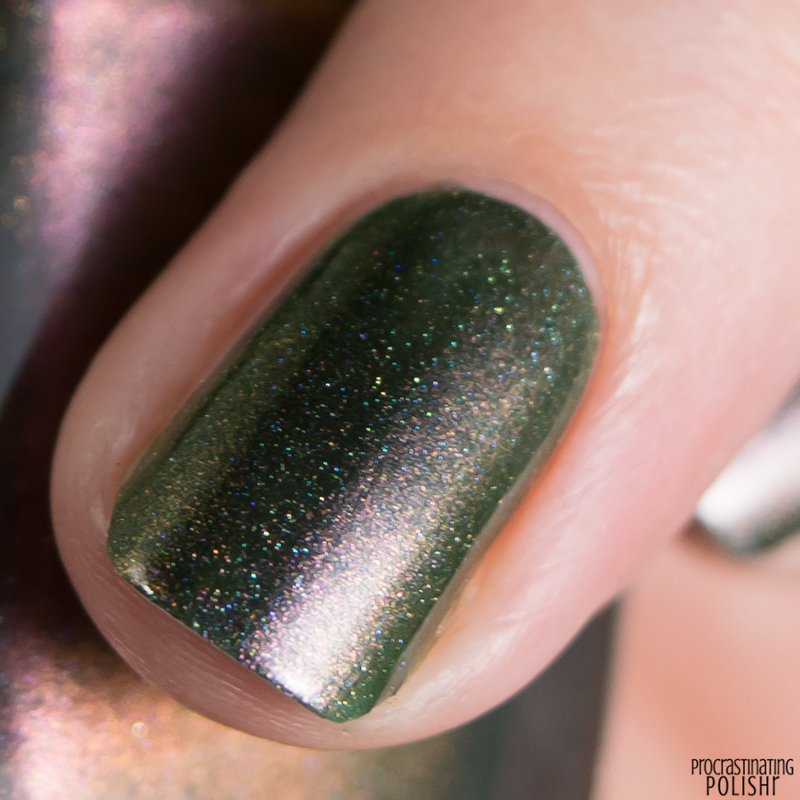 I can't even describe how much I love this polish. It's dark and dirty with gorgeous sparkle and it shifts effortlessly. 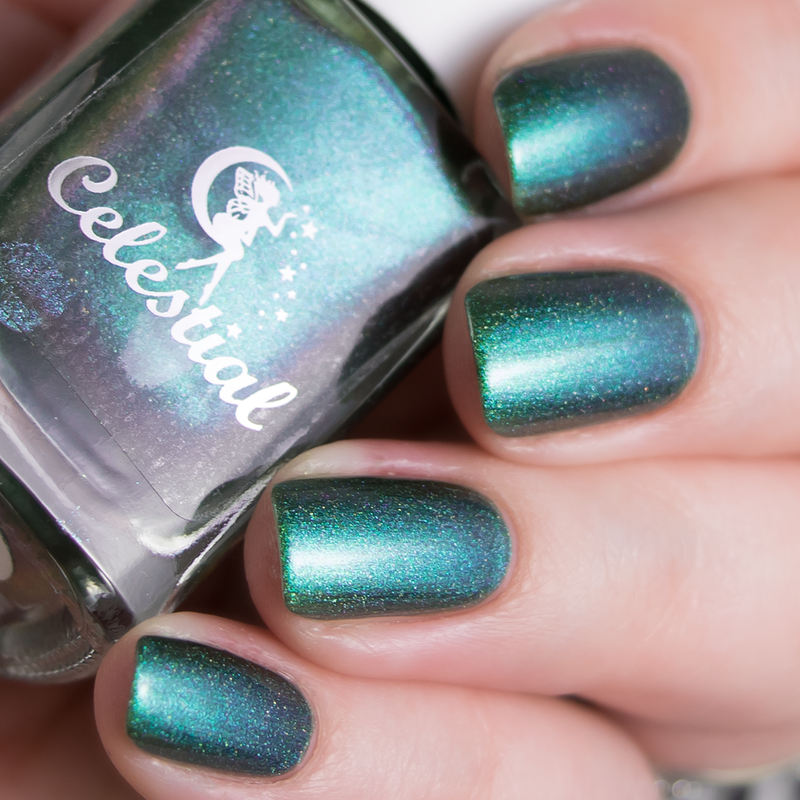 Basically this polish gives me an entire millenia of life. The formula is as beautiful as the finish, effortless and smooth. It's opaque in just two coats (as seen in my swatches) but will deepen even more with a third coat. Aqua tones shift to purple in this micro-flake filled sparkling beauty. Such incredibly intense colour with the appearance of textured metal while still being perfectly smooth. I was totally blown away by this polish and probably will be until I've used the very last drop. Again a gorgeous formula - the teensy tiny flakes are so small and delicate they glide onto the nail perfectly. Two coats was all I needed for a bold opaque finish. Rich deep red wine with subtle gold shift and delicate scattered holo. I found the shift was more evident going about my daily life than it would appear in photos, the gold shift is really quite stunning. I love these kinds of rich velvety tones! Formula is, of course, fabulous. 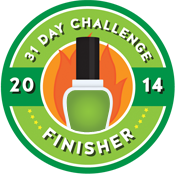 Two easy coats for a perfect smooth and opaque finish. 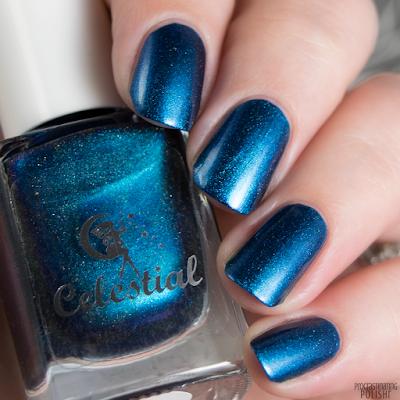 Bold and vivid electric blue with a scattered holo sparkle. 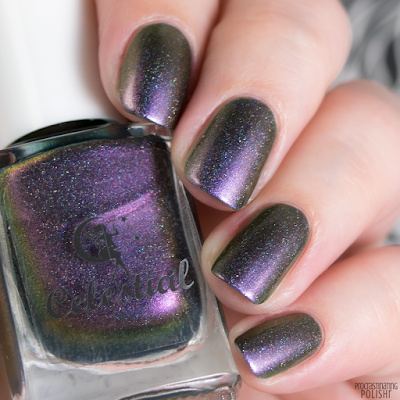 There's a hint of purple shift there on the curves of the nail, but for me this one is all about that colour. 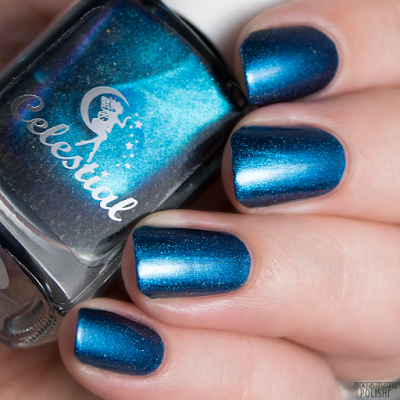 I have a thing for these dark electric blues and they're not often executed well, but Celestial have knocked it outta the park with this one. Would you believe I got all this colour in just two coats? So impressed! It's a lovely formula but can give a little hint of brushstroke, so use a slightly lighter touch for the best result. 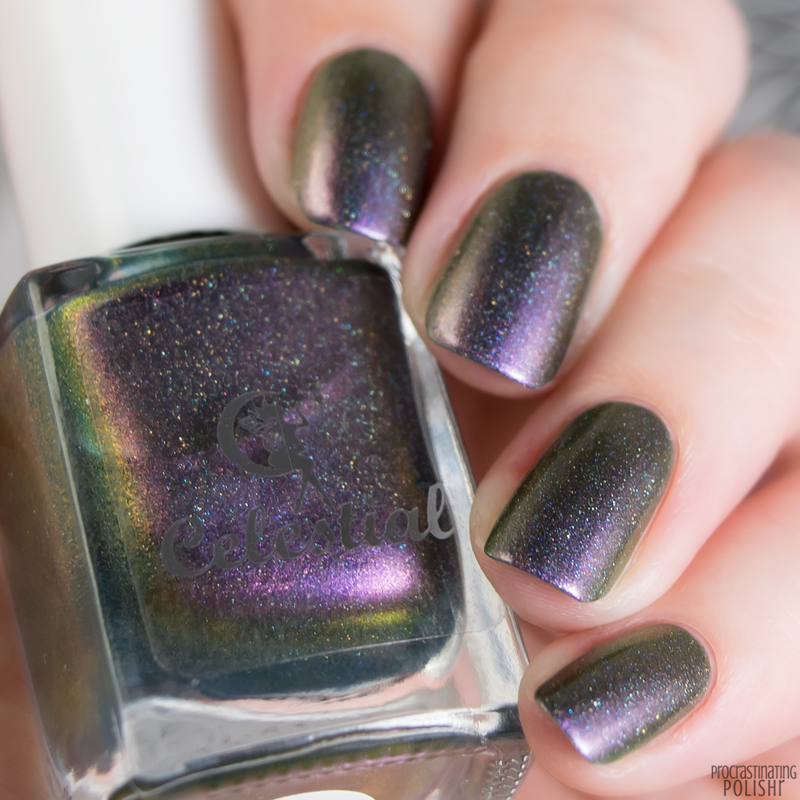 Another multichrome shifter - similar to, but not the same as Are You Mooning Me? The purple is the star here and there are more blue and yellow tones compared to the dirtier brown/gold tones of Are You Mooning Me? It's also got an extra dash of holo which gives a gorgeous rainbow of sparkle. Formula was beautiful and easy to apply, though you may be alarmed at how sheer it appears on the first coat! Thankfully there's no real cause for concern as it builds up to opacity quickly - my swatches show three coats. 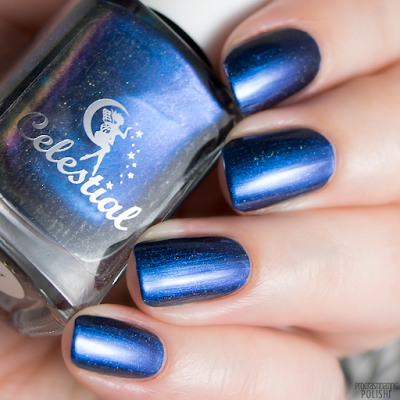 A metallic dusky blue with a subtle scattered holo. 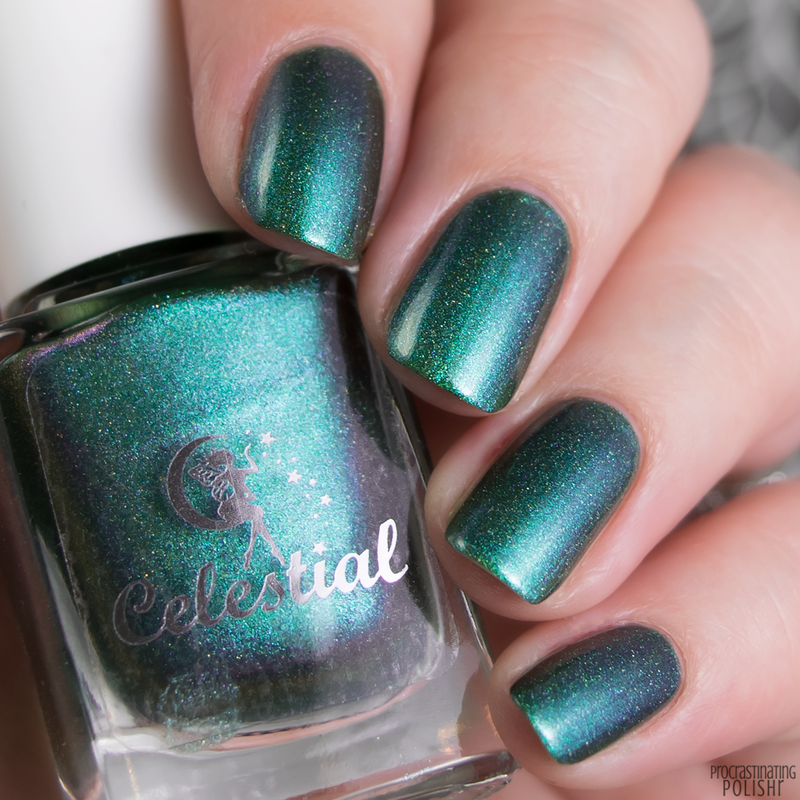 There's a beautiful aqua glow whenever light hits this shade - it's not quite what I'd describe as a multichrome but it does have a gorgeous multifaceted finish. It's quite a unique colour - and I say this as someone who owns hundreds of blues! This was the only shade in the collection I found to be a little fussy to apply, simply because it was more prone to brushstrokes. Careful application and a light hand will serve you well, and it's easy to work with to achieve an ideal finish. 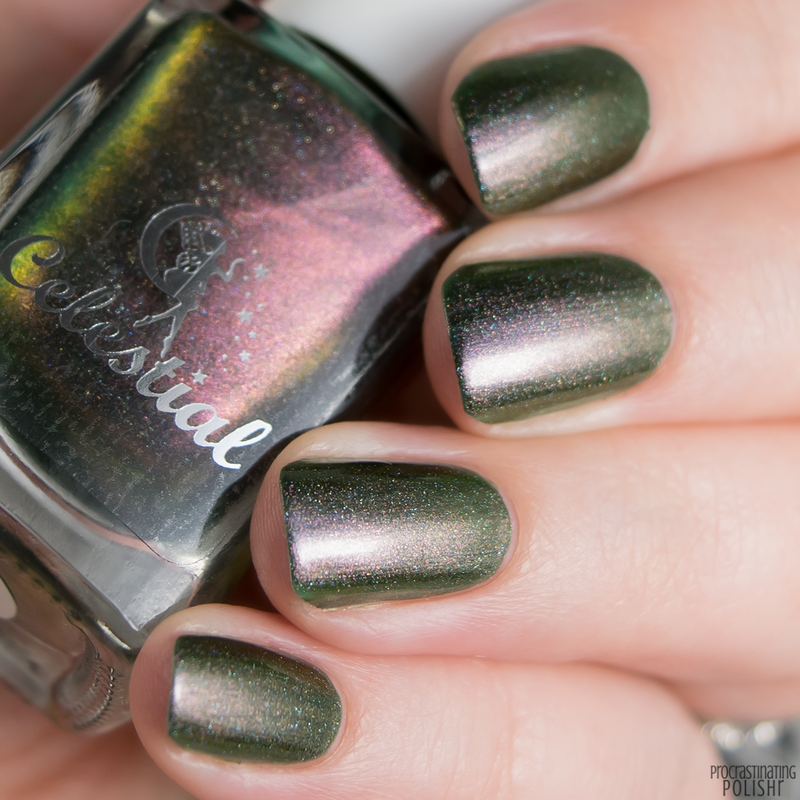 Swatches show two coats - gotta love that! Behold this beautiful blinding sparkle!! 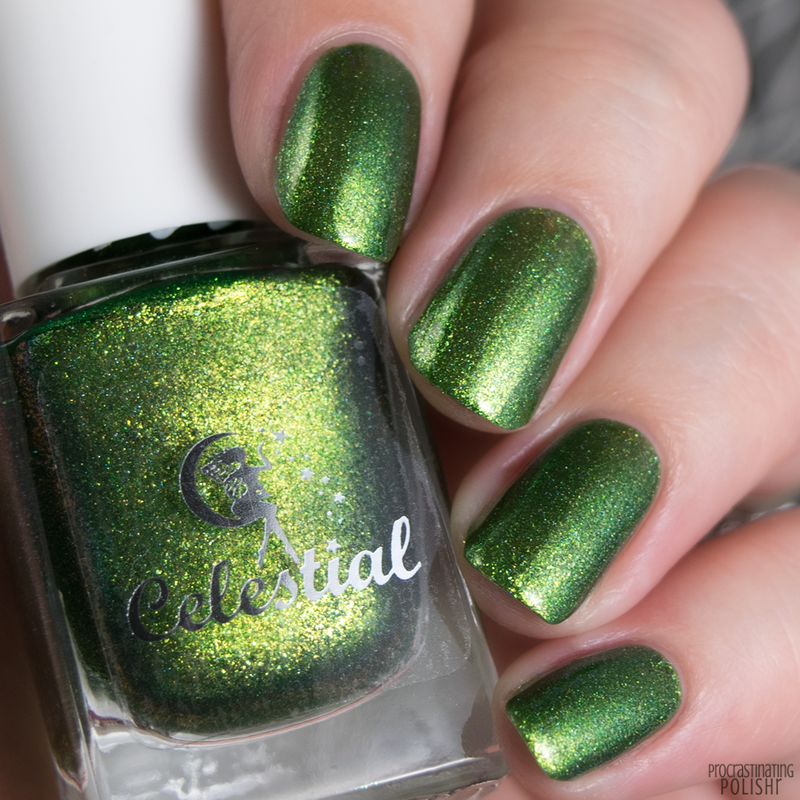 Ultra shiny green with a subtle gold shift, laden with those teensy tiny micro flakes and a delicate scattered holo, this just about broke my camera (and my mind). Hard as I tried I could not make my camera focus on this one properly, it's so reflective and bright! Needless to say, it's love. Formula wise it's a little fussier than Comet Me Bro, but overall still pretty damn wonderful. 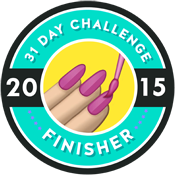 It's slightly patchy on the first coat so make sure it's well dried before applying more. Bright and opaque in two coats. 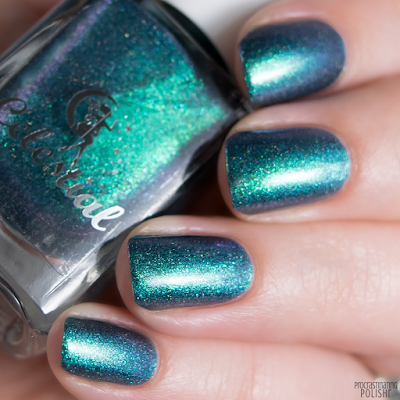 An emerald/teal subtle duochrome with scattered holo. The shift isn't always obvious, I find it subtly changes shade depending on the light. It has a beautiful glow that lifts the darker tones. The formula is smooth and beautiful to work with, self levels perfectly and dries smooth and shiny. 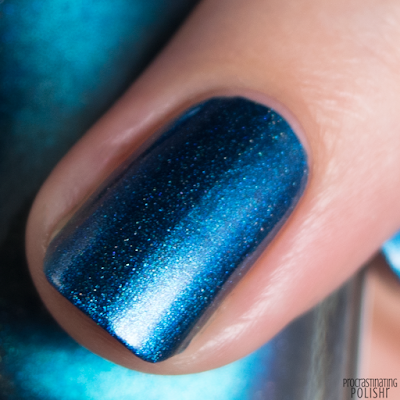 I needed three coats for this rich opaque finish. The Galaxy & Me collection is available from Celestial Cosmetics now, you can find them at celestialcosmetics.com.au (Aus shipping) and int.celestialcosmetics.com.au for international purchases.